The word "marriage" has been redefined in law and the culture, and is no longer connected with the reality of marriage. To take back marriage, we need to first reintroduce it in non-religious language so that people can understand it original goodness and beauty. Signs and posters can help educate and reinforce various aspects of the reality of marriage and family that have become hidden from our culture and the consciousness of our children, family members and others. The objective of signs and slogans is to give people things to think about over time. The idea is to provoke contemplation, not conflict. 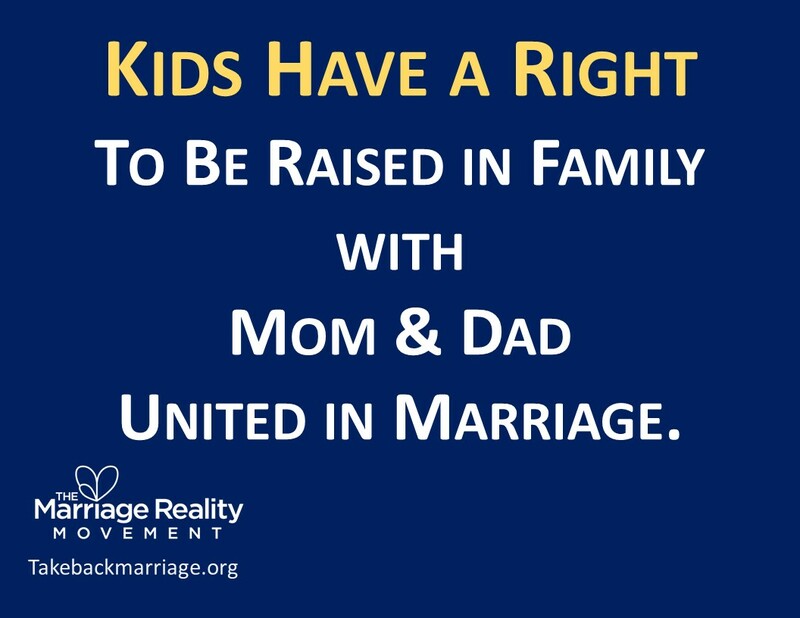 Remember the ultimate objective is to take back marriage in a way that its reality is supported and promoted by every law, every public institution and every curriculum based in the fundamental human rights of children to be born and raised in a family with their mother and father united in marriage. Small signs can be printed from pdf files on standard 8 1/2 X 11 paper and can be posted in various locations. Posters can be printed in large sizes and used for events and rallies. Images can be posted on Facebook, Twitter and other social media, placed on website, or used in other ways to help educate the public. Images can be downloaded by clicking on them and saving them to your computer or smart phone. Check back often as more signs and other resources will be added on a regular basis. are part of our identity.